It’s another proud first for Windsor,Connecticut! Carrying forth the torch for being first, swimmers for Windsor High School in Connecticut’s First Town, have earned WHS the distinction of being the first school to join the “Run to Honor Their Sacrifice” team in the ING Hartford MARATHON and Half Marathon – slated for Saturday,October 12. Connecticut Trees of Honor has been named a recipient of funds from the ING run. “Our committee is so excited that you are the first school to join our team and we are honored,” Connecticut Trees of Honor Committee Chairperson Sue Martucci wrote in a recent message to the students. In joining the “Run To Honor Their Sacrifice” team, WHS swimmers are being led by Social Studies teacher Christopher Todd, the boys’ team head coach and assistant Swimming & Diving coach for the girls’ team. The ING Hartford MARATHON and Half Marathon kicks off in Bushnell Park at 8 a.m. (wheelchair start is 7:55 a.m.). 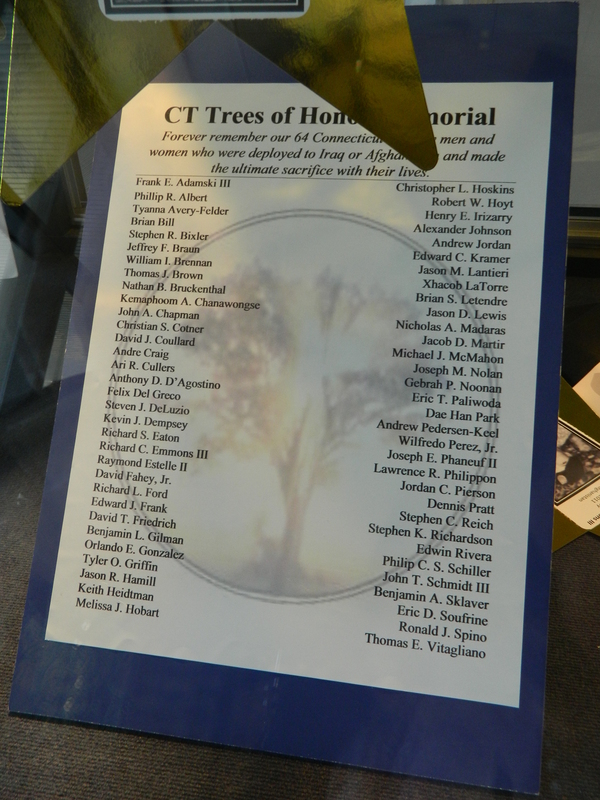 Fundraising efforts continue for a CT Trees of Honor Memorial which found a home in Middletown, Connecticut where Gov. Dannel Malloy spoke when the site selection was announced in June of 2012. In fact, a fundraiser for the “living trees” memorial will be sponsored in Middletown by the Italian/American Civic Order this coming Saturday, October 5 from noon to 6 p.m., 550 Arbutus Street. For more information call chair John Maddog Scanlon at 860-550-0831. CT Trees of Honor Committee members also include Diane DeLuzio, Nancy Rousselle, Rose Nolan and Ann Walsh. Go to http://www.cttreesofhonor.org for more information about the memorial, and to hear the song “Raise Your Flag”- Raise It High, wriitten and performed by the widow of a Marine killed in the war in Iraq, who at one time lived in New Britain.